The following 50 Plug-ins Bundle from Nomad Factory contains everything you might ever need to get the best out of your audio sequencer host application in a professional studio environment. * Now includes Nomad Factory product, "Cosmos". All you need is there and finally available to all at an unbeatable price! Designed to improve the quality of digital sound recordings. 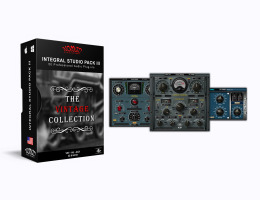 This bundle recreates the warm sound qualities of classic analog hardware. The sound quality of Blue Tubes is nothing short of amazing. Yet all 13 plug-ins provide a simple and functional vintage-style interface, as well as low CPU consumption for lightening-fast processing. The BlueVerb DRV-2080 is a vintage-style world-class recording studio reverb. This must-have reverb plug-in includes individual two-band equalization, as well as ambiance, decay RT60 and pre-delay controls. Whether sweetening mono or stereo tracks, or simply adding dimension to an entire mix, the BlueVerb DRV-2080 has all the flexibility you'll need to custom craft your sound. Intended to recreate the warm qualities of vintage-style digital reverbs from the 80s, the BlueVerb is nothing short of amazing. The BlueVerb DRV-2080 plug-in is available in RTAS, VST and AudioUnit format for MAC OSX and Windows 2000/XP. Impressive for tracking, mixing or mastering, the BlueVerb DRV-2080 is a well-designed, superb-sounding effects processor with a unique and attractive sound character. COSMOS is designed to improve clarity and punch without increasing gain, which results in a more balanced sound. COSMOS works great to improve the sound quality of any audio source, including compressed mp3 files, podcasts and voice-over work. COSMOS also features a tunable synth sub-generator that can give your audio a huge boost in the low frequency department. For years, audiophiles have used this secret technique to fatten bass parts, kick drums and give mixes a thunderous bottom end. COSMOS built-in limiter and imaging add an extra dimension of control and stereo enhancement. ECHOES faithfully models the greatest delay effects of all time, PLX-1 based on* Echoplex 1, PLX-3 based on* Echoplex 3, OILCAN based on* Tel-Ray Oilcan Delay, EHX-DM based on* Electro Harmonix Deluxe Memory Man, and ADM-2 based on* Boss DM-2 Analog Delay. The Liquid Bundle II gives you a variety of incredible effects plug-ins. The plug-ins in this bundle include Liquid Compressor II, Liquid Delays II, Liquid Gate II, Liquid Mod II, Liquid Phase II and Liquid Verb II. These tools are ideal for the sound designer, mixer and musician. And although this plug-ins provides intuitive and simple controls, the sound quality they deliver is full and warm. Plus, Liquid plug-ins operates efficiently to avoid over-taxing your CPU resources. MAGNETIC, a Reel-to-Reel Audio Tape Warming effect that gives your tracks the exclusive vintage tape sound which your ears crave. This effect can inject sterile audio with the warmth and character of classic tube circuitry and analog tape saturation. Please note, Rock Amp Legends is not available in AAX format! Rock Amp Legends comes with a number of factory presets sure to find their place in your music. The Bottom Line: If you have ever used other guitar amp simulator plug-ins before, get ready to be blown away by Rock Amp Legends. Nomad Factory has collaborated with guitarist Jimmy Crespo to custom-build the definitive guitar amp simulator plug-in. As a member of Aerosmith (1979-1984), the lead guitarist on a two-year world tour with Rod Stewart, and recording and performing credits that include Stevie Ray Vaughn, Jeff Beck, Stevie Nicks, Jon Bon Jovi, Clarence Clemons, Little Steven, Billy Squier, Bernie Taupin, Julian Lennon, and many others, Jimmy knows guitar tone! With guitar in hand, Jimmy Crespo worked in the studio with Nomad Factory to capture the signature sound behind Rock's biggest hits and design the best-sounding amp simulator plug-in on the market. Whether you play crunchy riffs, clean rhythms or screaming solos (or just want to "re-amp" a dry guitar track), the results speak for themselves. AAX, RTAS (Pro Tools), AU and VST plug-ins. AAX, RTAS (Pro Tools), and VST plug-ins.